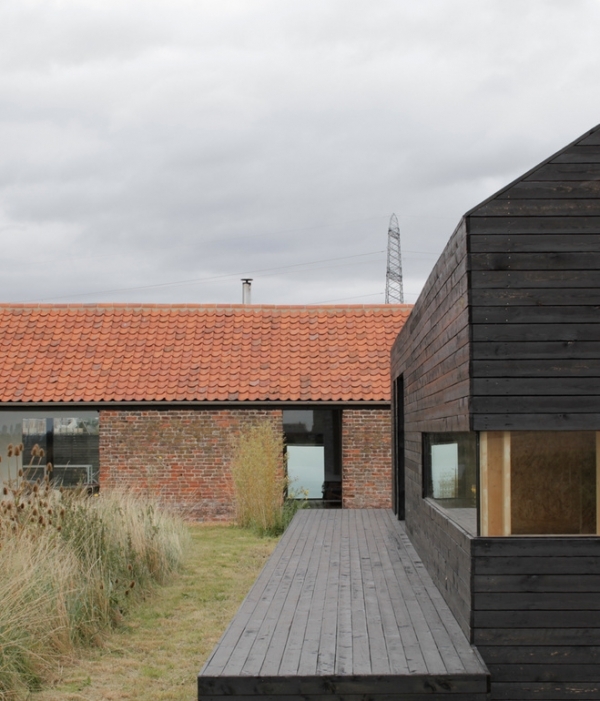 These gorgeous barns are located in England, in Norfolk to be exact. 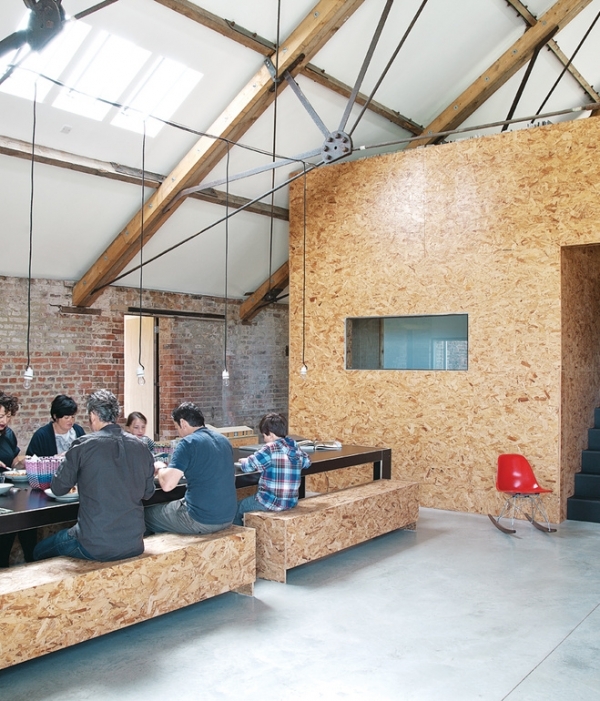 Designed by Carl Turner, these amazing spaces are full of stunning OSB furniture! We love the fantastic wood beams in this home. Vaulted ceilings and skylights brighten and open the space, and the gray floors are fabulous. 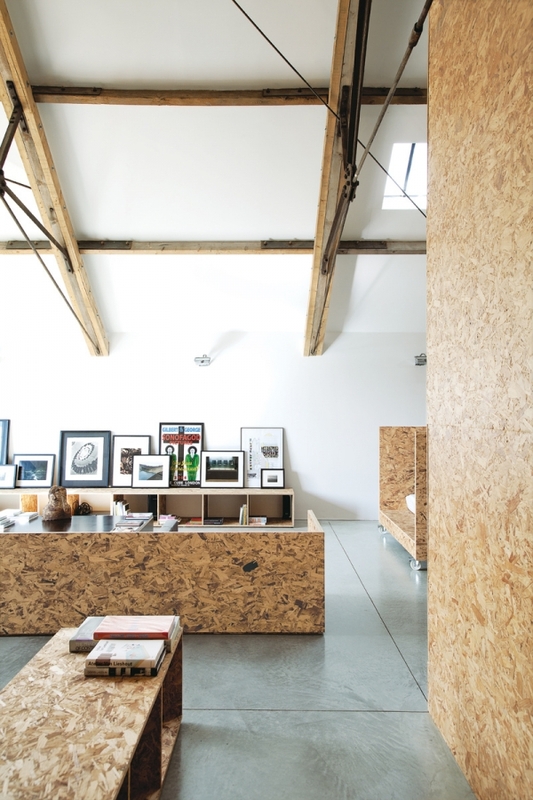 OSB furniture adds a significant amount of interest and provides wonderful storage space for the beautiful artwork and the small stacks of books. The brick feature wall in this area is just perfect. On a large block of concrete, a sleek fireplace is flanked by two lovely pieces of OSB storage. The architecture of the building is phenomenal with its asymmetrical design. Stunning hardwoods provide the foundation for a circular table and wooden chairs with a cozy gray fabric. The throws on the chairs are delightful, one continuing the grays and browns seen in the room, and the other, bringing a bit of bright blue to the outstanding design. The ceiling detail adds a touch of an industrial feel to the beautiful barn. The OSB furniture is functional and attractive. The high backs and sides provide a bit of coziness and privacy, and the built in shelving creates space, allowing for more storage in the home. The wheels are perfect, making the furniture transportable. The large dining space is adorable. 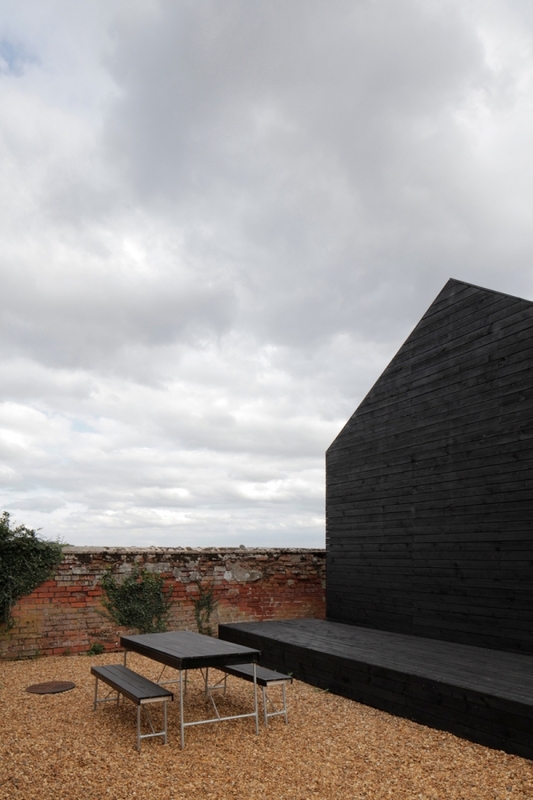 A long black metal table and OSB benches create the eating area. 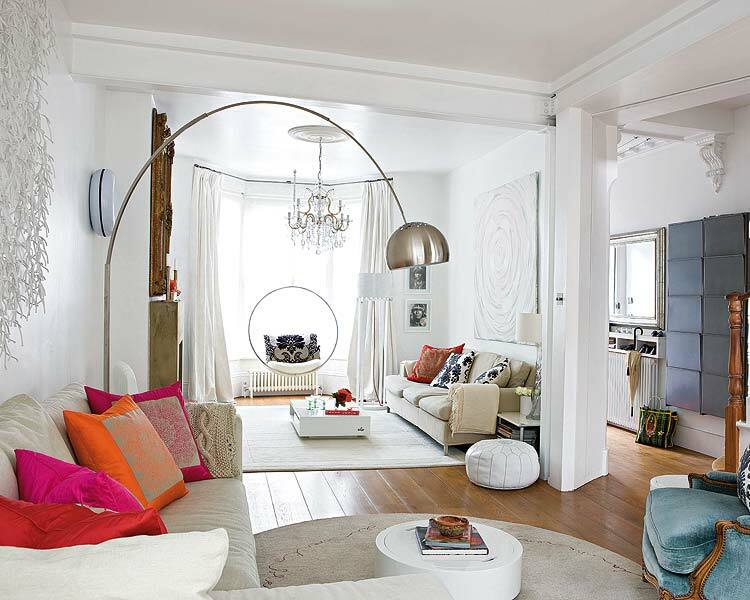 Simple lighting hangs from the ceiling, following the length of the table. 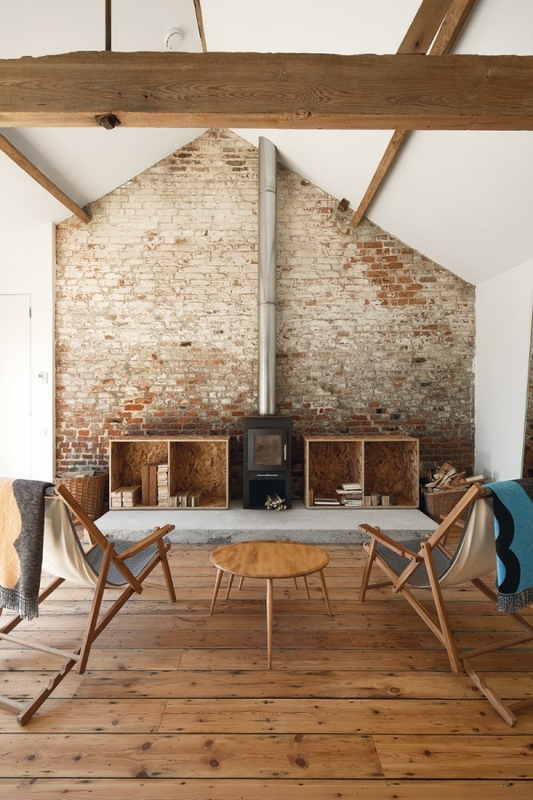 A brick wall and a red Eames chair bring even more interest to this simple but very attractive design. 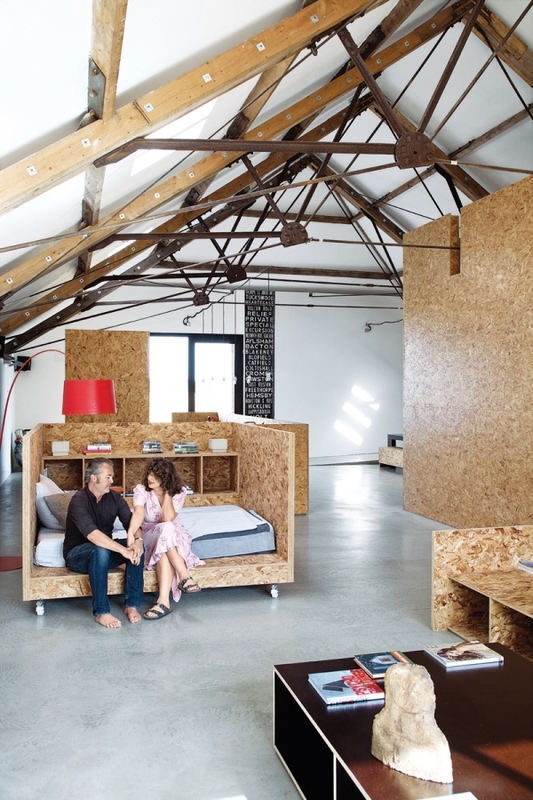 We love the bedroom, the OSB furniture adds so much interest to the space. 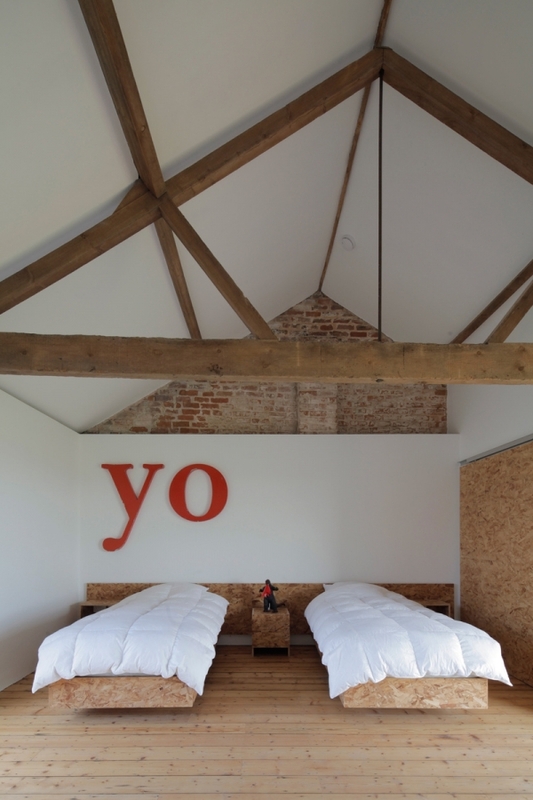 The brick and the wood beams continue the design seen in the other areas of the house, and the red yo is charming. The OSB beds have comfy white comforters, and natural hardwoods fill the floor: absolutely lovely. 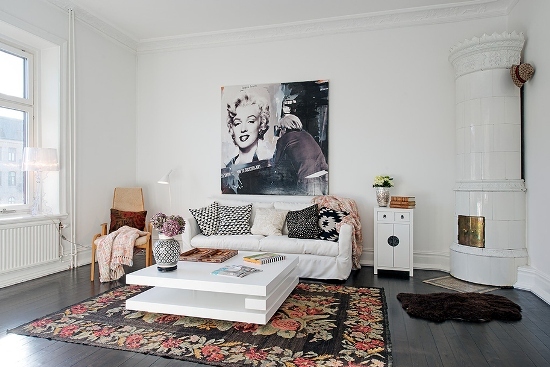 How do you find the idea about furnishing and decorating with OSB furniture?